Did you know that if you live in Arkansas you have a local archeologist to answer your questions? 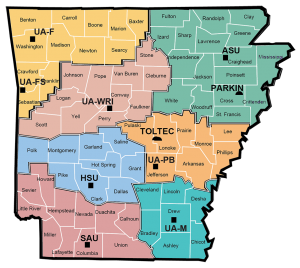 The Arkansas Archeological Survey has 10 research stations around the state with archeologists who teach, conduct research, and do public programs about archeology. Find the one near you. Visit the Arkansas Archeological Survey’s web page for more information about archeology in Arkansas and to find your local archeologist. The Survey’s mission is to study Arkansas’s past, to preserve and manage information about archeological sites, and to share what we learn with the people of Arkansas. We invite members of the public to help discover and record information about archeological sites in Arkansas. Want to learn more about Arkansas archeology and get involved in archeological excavations? The Arkansas Archeological Society is an avocational organization for people interested in archeology. It has seven chapters around the state that hold monthly meetings and talks about archeological topics. As a Society member you can also attend the annual Summer Training Program. There you can get training in field excavation, lab methods, and take classes from professionals.